Nicholas Colasanto (January 19, 1924 – February 12, 1985) was an American actor and television director, known for his role as "Coach" Ernie Pantusso in the American sitcom Cheers. He served in the United States Navy during World War II, and later attended the American Academy of Dramatic Arts in the 1950s. Colasanto attended Bryant University (now located in Smithfield, Rhode Island) and was a decorated veteran of World War II, during which he served as a coxswain in the United States Navy. Around 1954 he was supposed to be an accountant for a company in Saudi Arabia, but he instead attended American Academy of Dramatic Arts. He was of Italian descent. Although Colasanto was best known for his role as Coach Ernie Pantusso on the sitcom Cheers, he also directed episodes of many television series, notably Hawaii Five-O, Starsky & Hutch, Bonanza, Columbo, and CHiPs. Colasanto appeared in feature films, including The Counterfeit Killer (1968), Fat City (1972), and Alfred Hitchcock's Family Plot (1976). An in-demand actor and director, he had been diagnosed in the mid-1970s with heart disease, which was exacerbated by his alcoholism. After twenty years of alcoholism, he became an active member of Alcoholics Anonymous from March 31, 1976, and became sober in the same year. He began having trouble securing directing jobs by the end of the 1970s due to his declining health. His last major film role was a mob boss, Tommy Como in Raging Bull (1980). 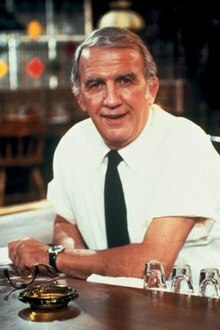 Colasanto was prepared to retire when the role of Coach Ernie Pantusso was offered to him on Cheers. Coach would become Colasanto's best known role. Suffering from heart disease, his health worsened by the third season of Cheers. Castmates noticed his weight loss, though the actor chose to keep the severity of his illness a secret. Shortly after the Christmas holiday in 1984, he was admitted to a local hospital due to water in his lungs. Co-star Ted Danson later commented that the veteran actor had difficulty remembering his lines during production of the season. When Colasanto was released in the week of January 28 – February 3, 1985, from the hospital after a two-week stay, his doctor recommended that he not return to work. Although he appeared in the cold opening of the third-season finale episode, "Rescue Me" (1985), his last full episode was "Cheerio Cheers" (1985), filmed in late November 1984. Colasanto died of a heart attack at his home on February 12, 1985, at the age of 61. On February 16, 1985, more than three hundred people attended his funeral, including John Ratzenberger, the only cast member of Cheers to do so. NBC would not allow the entire cast to take a break from filming to fly to Providence, Rhode Island where the funeral was held. Ratzenberger, a New England native, was sent as a representative for the cast. The cast and crew held a memorial for Colasanto on the set in Los Angeles. Colasanto is buried in Saint Ann's Cemetery in Cranston, Rhode Island. On April 19, 1985, Colasanto was awarded posthumously the Best Supporting Actor by Viewers for Quality Television, a (now defunct) non-profit organization that determined what was considered high-quality on television. Colasanto's character was written out of the show as also having died. The fourth-season premiere episode, "Birth, Death, Love and Rice" (1985), deals with Coach's death as well as introducing Colasanto's successor, Woody Harrelson, as Woody Boyd. Colasanto hung a picture of Geronimo in his dressing room. After his death, it was placed on the wall in the bar (part of the Cheers production set) in memory of him. Near the end of the final episode of Cheers, bar owner Sam Malone (Ted Danson) walks over to the picture and straightens it. Nakia (1974) – "No Place to Hide" and "A Matter of Choice"
^ Snauffer 2008, p. 51. ^ Brant, Marley. Happier Days: Paramount Television's Classic Sitcoms 1974–1984. New York City: Billboard Books. p. 231. ISBN 978-0-8230-8933-8. ^ a b c "Colasanto Strayed from Directing to Take Role as Cheers Bartender". Schenectady Gazette. Schenectady, New York. August 4, 1984. p. 25, TV Plus section. ^ a b c Snauffer 2008, p. 56. ^ Rhodes 1997, pp. 55–56, 58, 70. ^ a b "Nicholas Colasanto, Cheers Bartender". Sun Sentinel. United Press International. February 13, 1985. Retrieved October 9, 2015. ^ a b Leiby, Bruce R.; Leiby, Linda F. (May 31, 2012). "Part II: Episode Guide / Fourteenth Season". A Reference Guide to Television's Bonanza: Episodes, Personnel and Broadcast History. Jefferson, North Carolina: McFarland & Company, Inc. p. 184. ISBN 9781476600758. Retrieved October 9, 2015 – via Google Book. ^ a b c d e f g h Jones, Jack (February 13, 1985). "N. Colasanto; Played Coach Role in Cheers". Los Angeles Times. Retrieved December 27, 2011. ^ a b c "Celebrity Mailbag". Toledo Blade. March 2, 2002. Retrieved December 31, 2016. ^ a b Willis, John (1983) . Screen World: 1969. 20. Biblio and Tannen. p. 95. ISBN 0-8196-0310-4. Retrieved December 26, 2016 – via Google Books. ^ Holsopple, Barbara (February 14, 1985). "Cheers pays tribute to "Coach"". The Pittsburgh Press. Retrieved January 27, 2012. ^ "Nick Colasanto Dead at 61; Played Bartender in 'Cheers'". The New York Times. February 14, 1985. Retrieved December 27, 2011. ^ a b "Coach on TV's Cheers actor Colasanto dies at 61". The Gazette. Montreal. Associated Press. February 13, 1985. p. D-8. Retrieved October 10, 2015 – via Google News Archive. ^ Gendel, Morgan (April 6, 1985). "Loss of key cast members a fact of TV life". The Montreal Gazette. Retrieved October 8, 2015 – via Google News Archive. Morgan Gendel worked for Los Angeles Times at the time of publication. ^ Keets, Heather (February 11, 1994). "Coach's Last Call". Entertainment Weekly. Retrieved December 27, 2011. ^ "300 Mourn 'Coach' Colasanto". The Miami Herald. The Associated Press. February 17, 1985. page 4, section B (Local), Obituary column. ^ Snauffer 2008, p. 57. ^ Buck, Jerry (April 19, 1985). "The Results Are In for Quality Television's First Poll". The Orlando Sentinel (Three star ed.). Sentinel Communications Company. The Associated Press. p. E9 – via NewsBank. Record no: 0290180135. ^ "Birth, Death, Love, and Rice." 1985. Cheers: Season 4: The Complete Fourth Season. Paramount, 2009. DVD. ^ Liner, Elaine (May 21–22, 1993). "TV's favorite bar turns off the tap". Corpus Christi Caller-Times. Texas. p. A1. Record no at NewsBank: 113001A60C3FB35B (registration required). ^ Roberts, Jerry (June 5, 2009). "Dean Hargrove". Encyclopedia of Television Film Directors. p. 233. ISBN 9780810863781 – via Google Books. ^ Ironside: Season 1 (DVD). Shout Factory. ASIN B000MGBSQM. ^ Rhodes 1997, p. 55. ^ Rhodes 1997, p. 56. ^ Rhodes 1997, p. 58. ^ Rhodes 1997, p. 70. ^ a b Bjorklund, p. 39. ^ "Man Out of Time". Logan's Run. Season 1. Retrieved January 28, 2016. Bjorklund, Dennis A. Cheers TV Show: A Comprehensive Reference. Praetorian Publishing. pp. 35–39. Rhodes, Karen (1997). Booking Hawaii Five-O: An Episode Guide and Critical History of the 1968–1980 Television Detective Series. Jefferson, North Carolina: McFarland & Company, Inc. ISBN 978-0-7864-3108-3. Snauffer, Douglas (2008). The Show Must Go On: How the Deaths of Lead Actors Have Affected Television Series. Jefferson, NC: McFarland & Company, Inc. ISBN 978-0-7864-3295-0. Evory, Ann. Contemporary Newsmakers: 1985 Cumulation. Detroit: Gale Research Company, 1986. Print. ISBN 978-0-8103-2201-1.